We are interested in how people are getting along financially these days. Would you say that you and your family are better off, or worse off, or about the same financially than you were a year ago? This question is used by the Survey Research Center at the University of Michigan over the years to track consumer confidence in the United States. Usually, the cited statistic is an index that is constructed as follows: The percentage of "worse off" answers is subtracted from the percentage of "better off" answers, and then added to the number 100. Therefore, an index of less than 100 implies pessimism, an index of 100 implies neutrality and an index greater than 100 implies optimism. 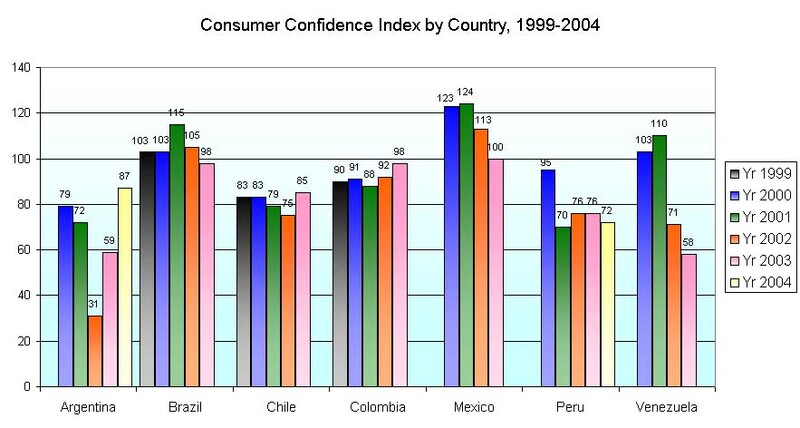 In the chart below, we show the consumer confidence indices for the various Latin American countries for those years in which the TGI study was conducted. How does this graph mesh with our knowledge with what was happening in these countries? The most striking pattern is in Argentina. At the end of 2001, the full political crisis blew up, during which there were five different presidents in Argentina in a brief period of just 13 days. Even with the consensus candidate of national salvation Eduardo Dualde in place, it was still by no means clear that the end is in sight. In fact, Argentina dived deep into the doldrums. Finally, in 2003, a new populist president Néstor Kirchner was elected and it looks like Argentina is finally climbing back up again. So this was one very steep U-shaped curve. The second most striking pattern is in Venezuela. Whereas it was doing find until 2001, the opposition consisting of business elites, union leaders and military officers executed a coup in April 2002 that temporarily sidelined President Hugo Chávez, who came back within a couple of days through a mass outpouring of popular support. Thereafter, the opposition continued their conflict with the government. Economically, the most devastating action was the employer-led strike known as El Paro, which went on for two months from December 2002 to January 2003. Thus, the pattern showed a sharp drop in 2002 and continuing to 2003. Presently, the opposition is attempting to get a presidential recall referendum. When the 2004 data become available for Venezuela, there is no expected to be much improvement. In Peru, Alejandro Toledo was elected president after his predecessor Alberto Fujimori abandoned his post and fled to Japan. Unfortunately, Toledo was totally incapable of managing the economy. His current approval rating hovers around 10%. In Mexico, Vicente Fox was elected president on the pro-business PAN platform in 2000, thereby breaking the PRI stranglehold. However, his job performance has been less than impressive.